Weight lifting reps, what are they? A rep or repetition relating to weight lifting or any form of resistance training is short for, repetition: one rep is a single cycle of lifting and lowering/pushing or pulling etc., in a controlled manner throughout a training exercise. Once advancement is achieved, there is almost as much going on within each repetition as there is within each set - to an experienced lifter. There is the concentric or positive motion in each repetition which is usually the focus of the upward contraction or force against gravity, e.g., raising the weight 'as in a curling motion', from the waist to the neck. The second part of the rep or repetition relates to the eccentric portion of the lift, this is the negative or lowering of resistance back to its original starting point. Where a full stretch at this point is encouraged in most training exercises. Age athletic ability and physical condition all come into play - for the most part, the rep ranges I outline below are the most consistently used for each level of lifter. 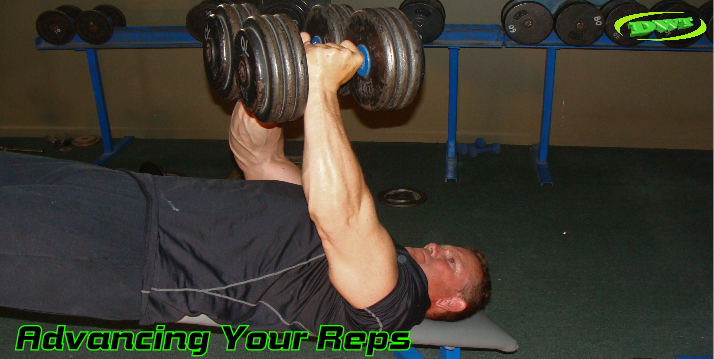 How to Determine How many Reps For Your Level? For beginners level: 1 - 6 months of consistent training, 10 to 12 reps.
For Intermediate level: 8 - 10 reps, six months to year and a half of consistent training. 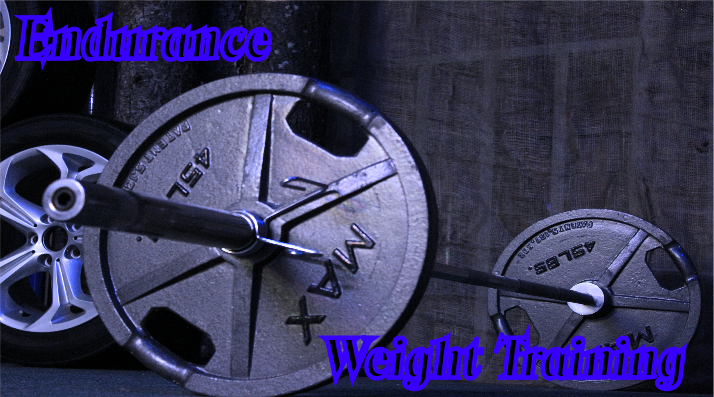 Advanced level training-for increasing strength: 6 to 8 reps. Two or more years of serious consistent weight lifting. Again, these are guides, but are close in relation to most of these lifting levels, if you’re trying to build size and strength. As time and experience is accumulated these can be adjusted somewhat. At the completion of 8 -10 reps this becomes referred to as an exercise Set of weight lifting reps. If your new to this type of training, this is a first step in understanding some of the terms related to weight lifting. Should I Stop If I Can Do More Reps? After a few months of consistent weight lifting you should not be setting the weight down merely because you’ve achieved the 11 or 12th rep; you should be physically forced to by gravity. If you’ve made the effort to start the set, make the effort to finish it. If you go over, by a few repetitions the gods will not strike you down. All exercises and weight lifting reps have and give benefit: just understanding that the best, overall contraction level for stimulating muscle size, is best received from the 8 to 12 rep range, especially as a beginner/intermediate. With that said: on the next set you perform of the same exercise try to adjust the barbell/dumbbell to an appropriate weight that puts you in the repetition range as discussed above. These figures are for guys as well as the gals and, I highly encourage all you gals to get out there and try your best. 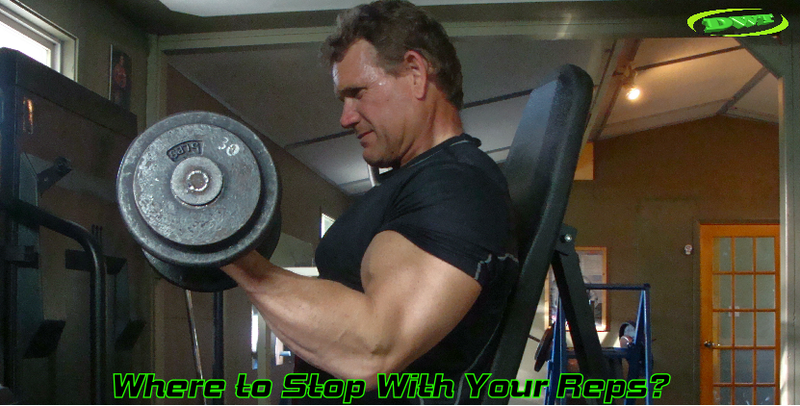 The best muscle shaping and toning routines will center around 8 to 12 reps per exercise. abdominal's and calf muscles they sometimes have a natural tendency to respond better at 12 to 15 repetitions in certain athletes. If you’re just after conditioning or general maintenance, your rep range should be in the neighbourhood of 12 to 15 reps. If you are circuit or cross training as beginner, these weight lifting reps and there ranges should not be out of line for you here. With respect given to having to adjust the poundage as your rest intervals will be smaller or even non-existent as you advance. For more advanced or senior intermediates meaning: a year and a half or more of serious weight training to your name; and are engaged in a mass or strength building cycle/phase, 6 to 8 reps is a safe range for building strength, as listed above. Weight lifting reps should be performed close to failure on most of your sets and should be centred around basic compound exercises preformed reasonably strict. 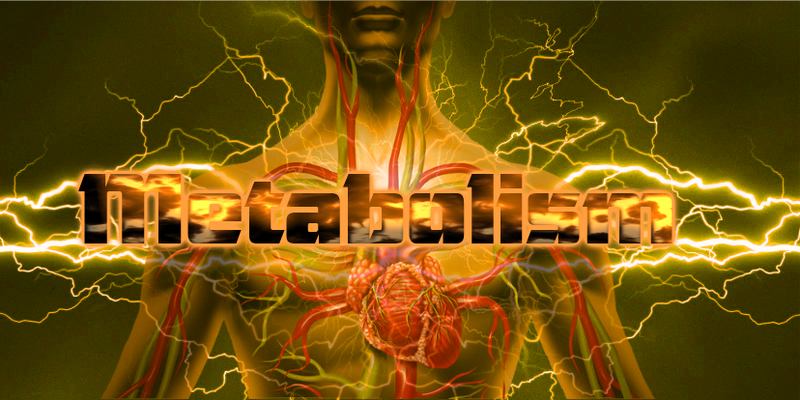 After 8 to 10 weeks of this type of training the body generally needs a break from the mental and physical stress it undergoes at this level. 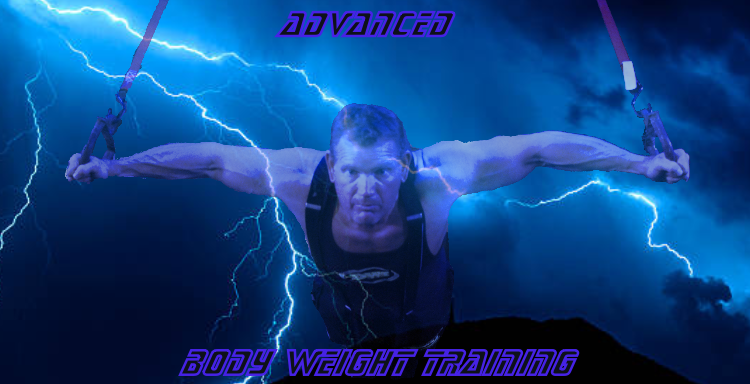 Scheduling a week or so at this point; after this type of training will help rejuvenate sore, tired or over trained muscles, joints and tendons. Finding What Works and Keeping it simple! Well... as with all things this article is only guide line to training success, these are not laws written in stone. I encourage you to experiment here and there with your rep ranges, and when you find something that works, exploit it. Understanding weight lifting reps and their set ranges goes a long ways towards trying to understand weight training itself, it is not complicated. Quite the contrary, it is actually quite simple. Stress in all of its forms are a hard thing to cope with in life, yet it always seems the simpler we make something the more fun we have and the better it seems to work... the simplicity of the exercises helps with this, especially in our fast-paced world. Bringing your imaginative and creative side into your reps and sets; plays a big part in the destination to your success and often depends on you doing one thing... enjoying the time of each rep in the gym!